The Lightweight Hose That Won't Kink, Tear, Or Leak! Hercules™ Hose is the toughest hose you'll ever own! Don't worry about running it over with the lawnmower or leaving it out in the elements. This hose won't tear or kink! Say goodbye to heavy hoses that tangle, kink, and tear. The Hercules™ Garden Hose is your new kink-proof, tear-proof, and leak-proof hose. READ FULL DESCRIPTION The Hercules™ Garden Hose has an interlocking armor design and steel casing that keeps water in and everthing else out. While regular hoses are impossible to wrangle and store, the Hercules™ Garden Hose stores easily. The lightweight, portable design rolls up neatly every time and moving Hercules™ Garden Hose from place to place is easy. Hercules™ Garden Hose is perfect for everday jobs like watering your garden or washing your car, and tough enough for tasks like cleaning out your gutters. Sun and heat rot plastic hoses until they blow. Hercules™ Garden Hose withstands extreme conditions and is guaranteed for life not to kink, tear, or leak, or your money back! Get your 25 ft. Hercules™ Garden Hose for only $19.99. But wait! 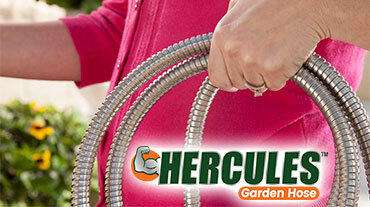 Take advantage of our double offer and get TWO Hercules™ Garden Hoses as and the Mighty Blaster. It can go from a fine mist to a powerful blast. Just pay a separate fee of $19.99. Upgrade to our 50 ft., 75 ft., or 100 ft. size Hercules™ Garden Hoses and you'll get the Quick Reel that'll store the Hercules™ Hose in seconds. Hurry and place your order now! Hear from other Hercules™ Hose customers how much they love it, and why you will too! Check out all the news for Hercules™ Hose and its creators at TeleBrands featured all over the world.